If you have tried to come to the web-site over the last several days, you might have been told it was unavailable. Of, if you were able to reach the site it was unbearably slow. The cause had to do with a data migration our web-host is running. The process was creating unintended issues for clients hosted on their servers. Today our site has completed it's migration and should be running as normal. Thank you all for your patience! Note: This post was originally featured at Painfully Hopeful. Productivity apps on the iPad continue to be one of the top selling points for the device. It's no surprise, then, that there are several office suites available in the App Store. This post is going to explore the three main "all in one" suites which are available on the iPad – Documents to Go, Quick Office, and Office2 HD. Apple's iWork is also available in the App store, but the "separate app" nature of the suite sets it outside the scope of this comparison. Today we'll be looking at the fourth, and final, comparison – importing and exporting. Each suite will be reviewed on both how they deal with data both on a local network and to the cloud. One of the selling points for Quick Office is the ease of which documents can be uploaded to, and retrieved from, computers on the local network via a built-in file transfer interface. This setting can be toggled by tapping the gear button in the file screen and toggling the "file transfer" option. Turning the option on will reveal an ip address which can be used to acces files which are locally stored inside Quick Office. For additional (or, really, any) security an added authentication option can be toggled which will require users to input a user and password combination before connecting. It's a good idea to make sure this is on. Once file transfers are enabled, users can access Quick Office's files (for locally stored files only) though a simple web-interface, or by connecting to the server through the finder or windows explorer. In my experiments with Quick Office I found that the file transfer server will disconnect a finder connection when switching to another app on the iPad – this is probably a limitation of iOS. 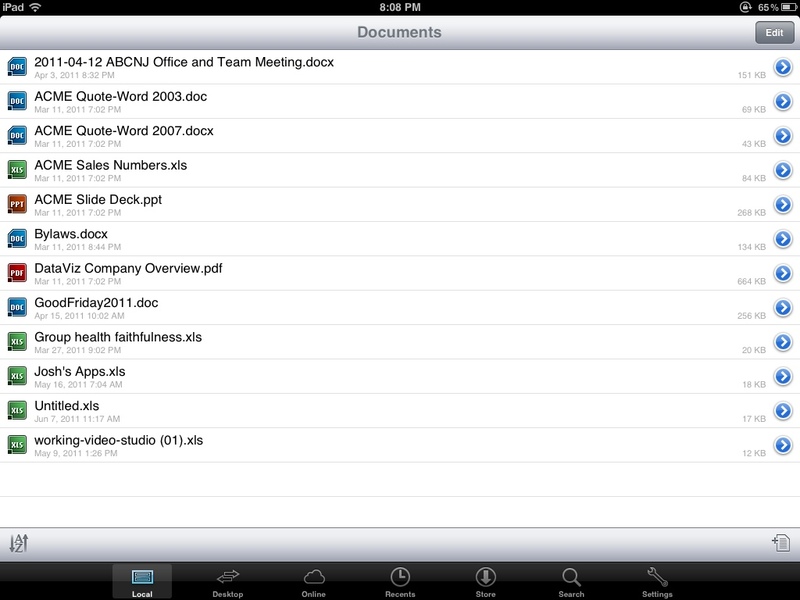 Quick Office HD also has an impressive number of options available for storing documents in the cloud. Aside from the "big three" of Dropbox, Google Docs, and Box – Quick Office also allows to connections to Sugar Sync, Evernote, and several more. Connections to these services benefit from Quick Office's excellent file managment tools, however features which are unique to each service are not implemented. This is especially true for the lack of "starred documents" in Google Docs. Documents imported into Quick Office are handled well – even supporting elements such as outlines, which cannot be generated by the suite itself. Quick Office will also display unrecognized fonts in a default sans serif face without stripping the font information from the actual document. The suite handles spreadsheets well, but my two test presentations suffered from lost formatting and stripped animations. 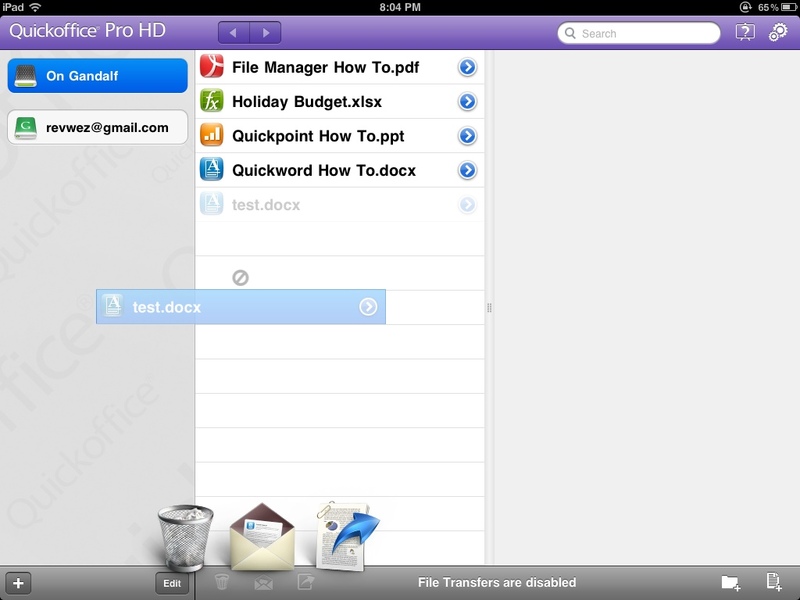 As with Quick Office, HD Office2 HD has a built-in file transfer option. This can be access by tapping the gear button in the lower left of the file management screen and toggling "Enable File Sharing." Similarly, security can also be enabled for this feature. While Quick Office has a colorful and well-thought out web interface, Office2 HD brings up a plain list hyper-links with an upload button at the bottom of the page (which you will probably need to scroll down to reveal). It gets the job done, but it's not fun to look at. If you are using the file transfer option for this suite connecting via the finder or windows explorer is a better option. The available options for cloud storage are not as great as in Quick Office. The "big three" are present, as are some other players, but that's it. The suite, however, adds the ability to connect to a service via webDav – so "roll your own" cloud storage is an option. Importing files into Office2 HD doesn't render quite as good results as Quick Office. Unrecognized fonts are displayed in a sans serif font (and retained when opened elsewhere). Outline lists, however, are not displayed correctly though, again, the formatting is retained when opened elsewhere. The application handles spreadsheets well, however, and has in previous months been able to handle files which caused the other two suites to crash. It retains most cell formatting, but cannot hide cells. My first test presentation displayed with moderate success. My second test presentation removed the gradient background and didn't handle a bullet list very well. Neither presentation retained animations. Unlike the other suites in this comparison, Documents to Go makes use of a desktop application to handle local transfers. In one sense, this can be seen as a hassle, because it requires the downloading an application to transfer documents over a local network. On the other hand, Documents to Go removes the need to manually move documents between devices (as in the other two suites). 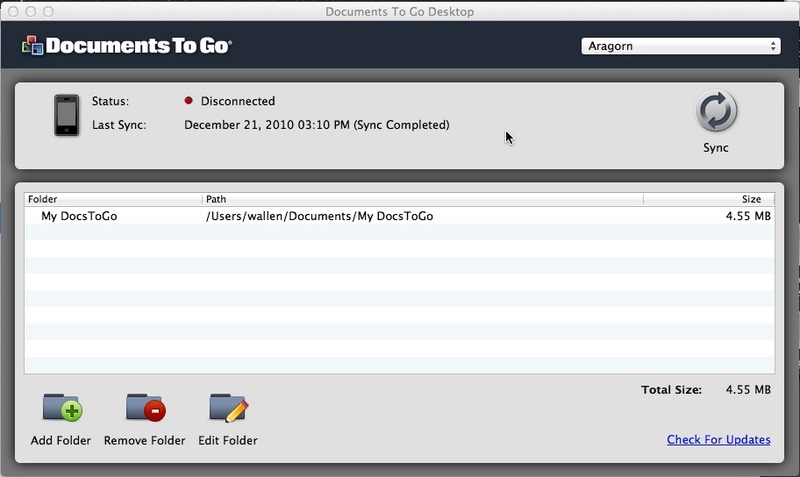 Once installed, Documents to Go's desktop application creates a folder which will automatically sync files across devices. For uses who want to sync only on their local network, this is a good option. Documents to Go has the least available options for cloud storage out of the three suites in this comparison. It has the big three, and adds only Sugar Sync as an alternative (each suite also offers iDisk, but this product will soon be discontinued so it can hardly be counted). It does, however, offer some special hooks for GoogleDocs users (the previously mentioned "stared documents") – this is a nice touch. Files imported into Documents to Go are displayed nicely. Text is re-flowed for the screen and font information is retained. I sometimes noticed a glitch in the font for outlines when a document is created in the Suite and then uploaded to GoogleDocs, which is an error which should be addressed. Also, Documents to Go has a tendency to strip out paragraph spacing when information is moved through the suite. Again, this is a glitch which I'd like to see fixed. 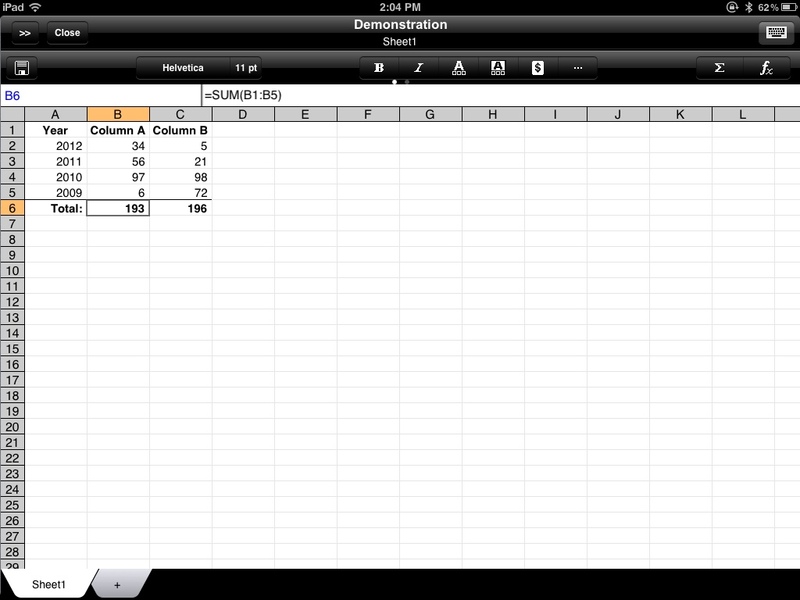 Spreadsheets imported well, retaining cell formatting and even hiding cells which had been hidden in GoogleDocs. One of my test presentations, however, caused the application to crash. Each of these suites handles importing and exporting in slightly different ways. Documents to Go allows for local syncing, which is a plus, but the added step of installing a desktop application to do so is a non-starter for many. The local file transfer feature for the other two suites is a nice touch (though the web interface is prettier in Quick Office) but requires a manual transfer of data. Again, this is a non-starter for many users. Each suite has the "big three" cloud storage services available, but Quick Office offers the most options of all the suites. To it's credit Office2 HD has built-in webDav support, allowing users or organizations to set up their own cloud storage services. Documents to Go has the fewest cloud storage options available, but has some key features GoogleDocs users will appreciate. The suites each do a credible job importing word processing documents and spreadsheets, but are dismal when importing even the simplest of presentations (really, don't even bother). The parity of features for each suite makes it difficult to declare a "winner" in this category. As a GoogleDocs user I tend to lean towards Documents to Go, but users of other cloud solutions will be happy with any of the three suites in this comparison. Note: This post was first featured over at Painfully Hopeful. Each suite will be explored for file management, editor layout, editing features, and importing/exporting. We'll primarily look at the word-processing features of each suite, but will also compare the spreadsheet and presentations modules for each app. Today we'll be looking at the second comparison – editor features. This installment of the series is going to be handled a bit differently. The same three suites will be reviewed, but we'll break down the review for each module in the package – Word Processor, Spreadsheet, and Presentation. This is the module I use most in any of these suites. Given that I have to write what amounts to a short reflection paper every week, this makes sense. As was pointed out in the previous segment of this comparison, Quick Office HD attempted to create a simple interface which was pleasant to look at and easy to navigate. Unfortunately, the shortcomings of their interface choices also impacted the feature set they included in the suite. The word processing module can do basic character formatting, color and font changes, and simple paragraph formatting like indents and lists. It handles these tasks, decently and can interpret more complex formatting well when it's imported into the suite, but there is no way to handle more complex formatting directly in Quick Office HD. There is no way to customize lists or add spacing between paragraphs. These are two features I use constantly, so their absense is something I feel. 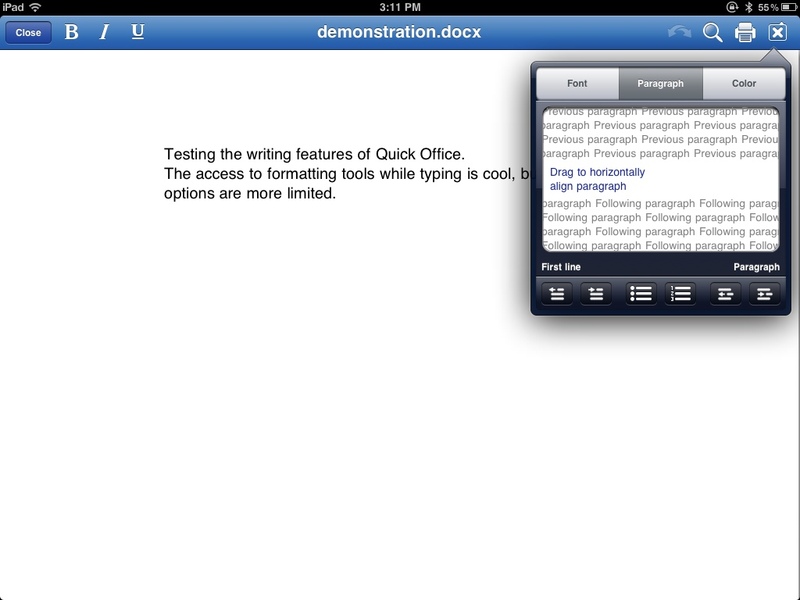 Quick Office HD feels like a mobile editor, which is odd given their decision to present content in a page-layout view. It's useful for editing existing documents, or creating documents with basic formatting, but it doesn't seem to be designed for complex projects. For an inexpensive package, Office2 brings a lot of punch to the features debate. This suite handles all the basic formatting covered by Quick Office HD. It also, however, has an excellent slate of advanced formatting features. Paragraph spacing, line spacing, columns, manual breaks and tab stops, and full-fledged styles. While I gave Office2 HD poor marks for it's cluttered interface, it seems the developers were busy adding an insane amount of features to their product. In addition the already listed features, this suite also allows the insertion of images and footnotes into a document. Something no other application in this comparison is able to do. The desire to have desktop-level features in their application is admirable, and it is rather amazing to have so many options available on a mobile editor. Unfortunately, some of the features feel half-baked. When version 5 first came out, the suite was sluggish – leaving many of the advanced features buried behind a frustrated waiting game. Two iterations have passed since 5.0 was released, however, and the speed has gotten better each time. 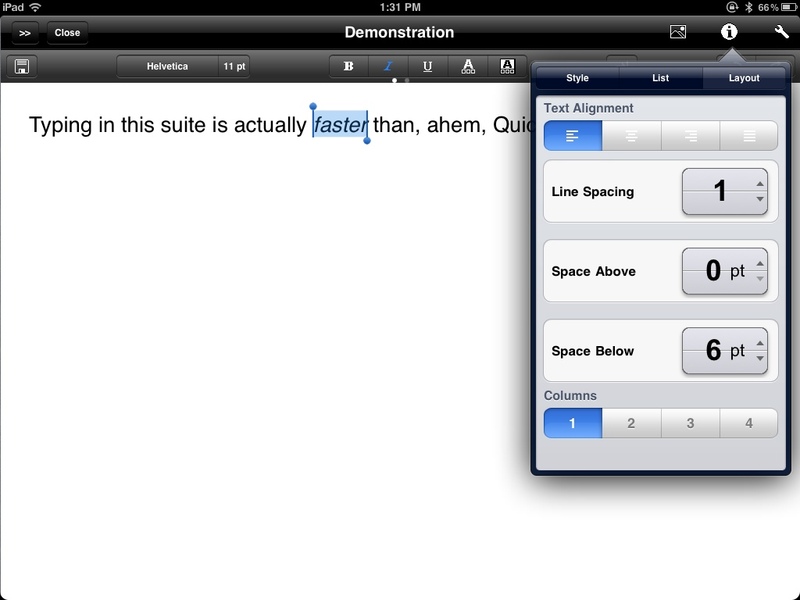 In fact, Office2 is actually faster on my iPad than Quick Office HD. Other features, however, still need some work. Hanging indents on lists have a tendency to disappear once a document is closed and re-opened. This is a suite which shows much promise – but it still needs to work out some kinks. As with layout, this suite splits the difference between the other two in this comparison. It has many of the features included in Office2 except paragraph styles, images, and footnotes. In place of these omissions, however, Documents to Go adds an extensive array of list options. This includes a good range of multi-level lists for the creation of outlines. As this is a feature I use every week, it's something I appreciate. Unlike Office2, the advanced formatting features in Documents to Go "just work." The only glitch I've discovered so far is the omission of paragraph spacing when a document is synced and retrieved from Google Docs. This is an inconvenience, and one which I wish would be rectified, but it's not a show-stopper. I use spreadsheets infrequently, but when I do they are an indispensable tool for my work. 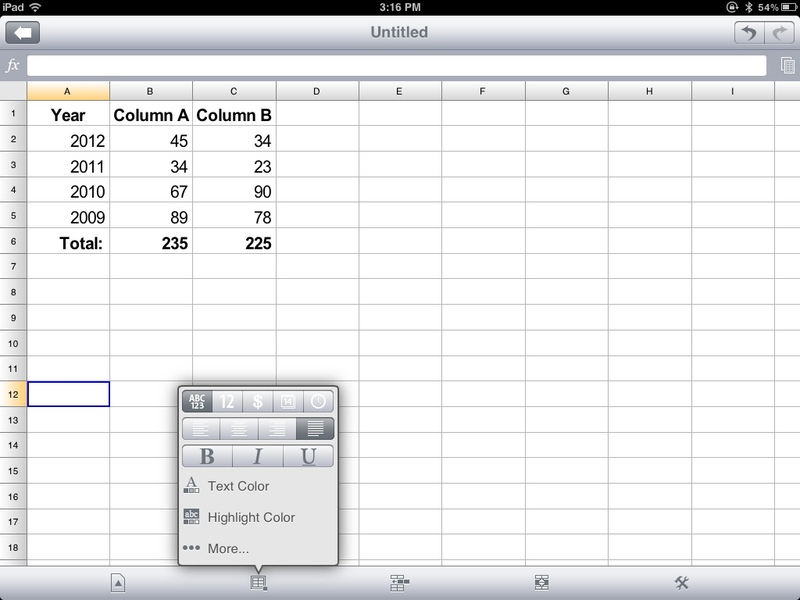 The Spreadsheet module in Quick Office HD is slick, fast, and intuitive. Functions are easily accessed next to the editor bar, and some basic formatting is found in the main editor window – including the option to format cell data into a pre-arranged type. Other editing includes the ability to do simple borders, change cell color, and align cells both vertically and horizontally. In fact, the same "drag to align" interface which seems unnecessarily graphic in the word processor feels elegant in the spreadsheet. 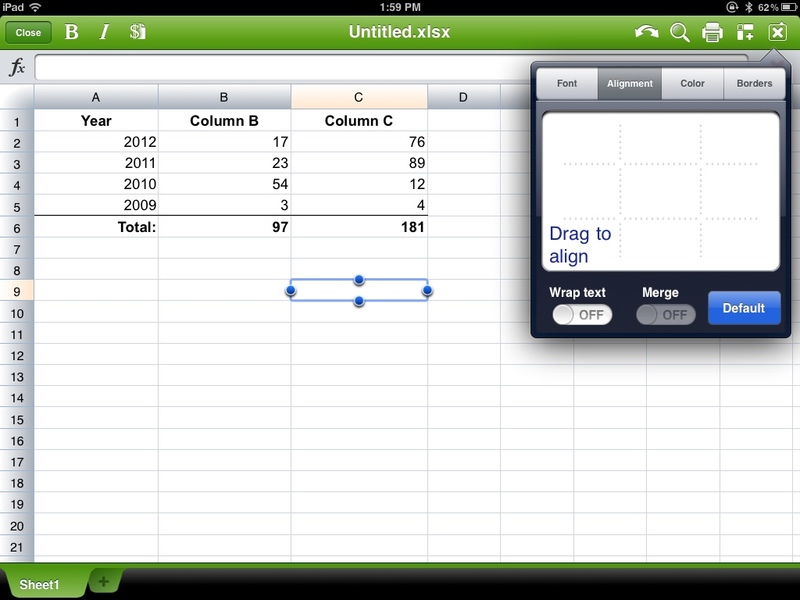 Merging cells and wrapping data in a cell is also easily accomplished. Selecting multiple cells in Quick Office HD is also easily done. When a cell is selected, a handle appears on each side which can be used to drag a selection across multiple rows, columns, or both. The spreadsheet (called "workbooks" when you create a new one) in this suite has a great many features, all accessed through the buttons on the editor toolbar. Included among these buttons are quick borders, and button which will sum all the data in a column (I love this). Data types are found under a dollar sign icon, but advanced formatting is found under an unattractive "..." icon (again, the interface needs a little work). As with the word processor, the formatting buttons span between two pages. Selecting multiple cells isn't initially as elegant in Office2 HD as it is in Quick Office. A basic selection requires double tapping a cell and then dragging through the cells you want – a handle appears which can be used to adjust the selection. Alternatively, however, if you tap a single cell and then long-tap another cell a range can will selected (row, column, or box depending on where you long-tap). This would be helpful when trying to select a very specific data-set in a large spreadsheet. Documents to Go has an impressive array of functions which can be done with it's spreadsheet, and can handle basic formatting to display it's data. Borders, however, are missing from it's tool-set – which I find an odd omission. The spreadsheet module of this suite, however, does add the ability to hide and unhide rows and columns. This is helpful, for example, when a spreadsheet is used to create a schedule – past weeks can be hidden from view to allow the quick browsing of data. Selecting multiple cells in Documents to Go, however, is an exercise in frustration. The feature is accessed by double-tapping a cell and then dragging. There is, however, no handle present which can later alter a selection. On large spreadsheets, this creates headaches when attempting to select data. My initial response to anyone wanting to use the presentation modules in these suites is, "Just use Keynote." As they are a bundled part of the suite, however, I include them in this comparison. I won't bother with the screenshots, though, it's just too depressing. 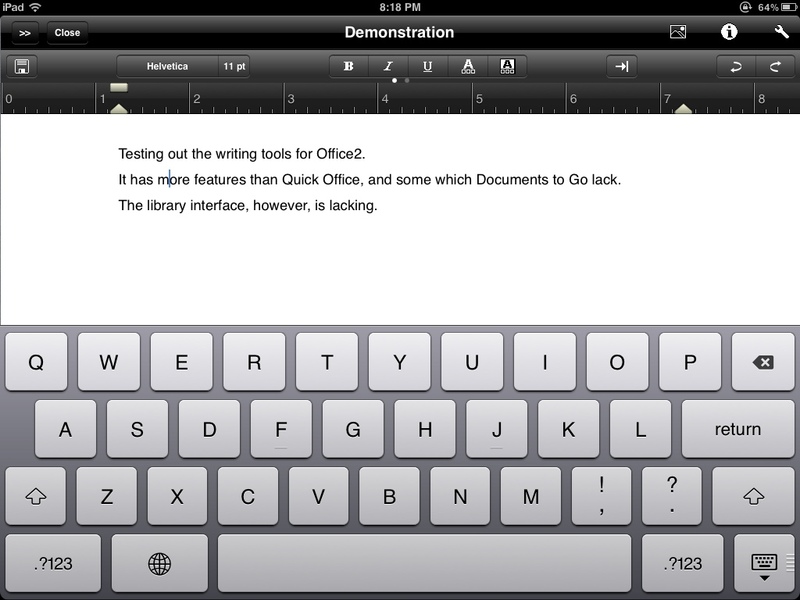 When thinking of the presentation module for Quick Office HD the word, "rudimentary" comes to mind. It has support for the formatting of basic shapes and text boxes – and that's it. No builds, no backgrounds, no transitions. Just the text and shapes. The purpose of this app seems to be to display, and edit, imported slides rather than build new presentations from scratch. This presentation module includes a few more features than Quick Office, including the ability to set a background image. In addition, there are some included slide templates and to import images into slides. Builds, transitions, and compositing features (such as borders and drop shadows) are not included. I also find the presentation module to be a bit unstable, as it tends to crash when inserting images. If Quick Office was "rudimentary," the presentation module in Documents to Go is "bare bones." There are several simple templates offered when creating a new presentation, but once created the content of the slides can only be altered via an outline view! Speaker notes can be added to slides, in the slide-view mode – but I'm not sure why anyone would bother. If you're not importing slides into Documents to Go, it's best to forget this module even exists. In terms of sheer features, Office2 HD dominates. It's advanced formatting for word processing documents, and several nice touches to it's spreadsheet module, make it come out on top. Some of the features aren't quite stable, however, so it might be best to save often when using this suite for content generation. Over all, Documents to Go comes in second due to a stellar word processing feature-set – but Quick Office's spreadsheet module is also a tempting offer. Each suite will be explored for file management, editor layout, editing features, and importing/exporting. We'll primarily look at the word-processing features of each suite, but will also compare the spreadsheet and presentations modules for each app. Today we'll be looking at the second comparison – editor layout. Quick office places it's formatting buttons at the top of the editor screen. The number of buttons is minimalist, with text formatting options to the left and tools to the right. The buttons are persistent, allowing for quick formatting without too much trouble. Oddly, many formatting options are hidden behind a gear icon - grouped with the tools. Found under the gear icon are font options, alignment, lists, colors, and indents. While I applaud the attempt at a minimalist interface, I don't find burying the bulk of formatting options in one cluttered interface to be an elegant solution. Quick office also displays it's content in a page-layout format - allowing a content creator to see how their content will look when printed or exported to a PDF. This can be a useful feature in some instances, but it ends up wasting most of the iPad's screen real-estate with an exciting display of document margins. If Quick Office to be minimalist in its layout, Office2 HD celebrates complexity. There are two "pages" of buttons in it's interface - the first holds text formatting options and the second contains paragraph level formatting like alignments, lists, and intents. There is, however, one paragraph level formatting option which can be found in the first page of options - paragraph styles. While is is more a "feature" than a layout choice, Office2 HD is the only "all in one" mobile office suite which supports paragraph styles, and their inclusion as an obvious option is welcome. The buttons are not persistent, though, they only appear when the keyboard is engaged. They also feel cramped, and accidental taps are not uncommon when flicking between button pages. This suite also defaults to page layout view. Unlike Quick Office, however, there is an option to switch to "screen layout." This makes much better use of the iPad's screen size, and also allows users to zoom the text to a comfortable level without affecting the layout of the page. Documents to Go places it buttons at the bottom of the editor. This is likely a carry-over from the iPhone UI, where bottom buttons are easier to reach while typing, but it translates well on to the larger screen. There are five buttons in this row - file options, text formatting, paragraph formatting, lists, and tools. Each button tap reveals a list of common options for that category, along with a "more" option to access more complex formatting. The buttons, however, are not persistent and actually disappear when the on-screen keyboard is active. Again, this is likely a by-product of the suite being a universal app. Hiding the buttons when typing makes some sense when using a smaller screen, but on the iPad the vanishing act gets frustrating. Unlike the other two suites, Documents to Go doesn't have a page layout view. It uses a screen layout view only, reflowing the text as a user pinches and zooms the content. Given that screen layout view makes much better use of the iPad's screen, the lack of a page layout option isn't missed much. Quick Office attempts to create a fast, minimalist, interface while laying out content with a metaphor common to a desktop suite (page view). In the end it ends up failing in both button layout and content layout. Office2 HD has a complex, and cramped, interface. It does, however, have two views for content - allowing a user to view content in a way which makes sense on an iPad's screen. 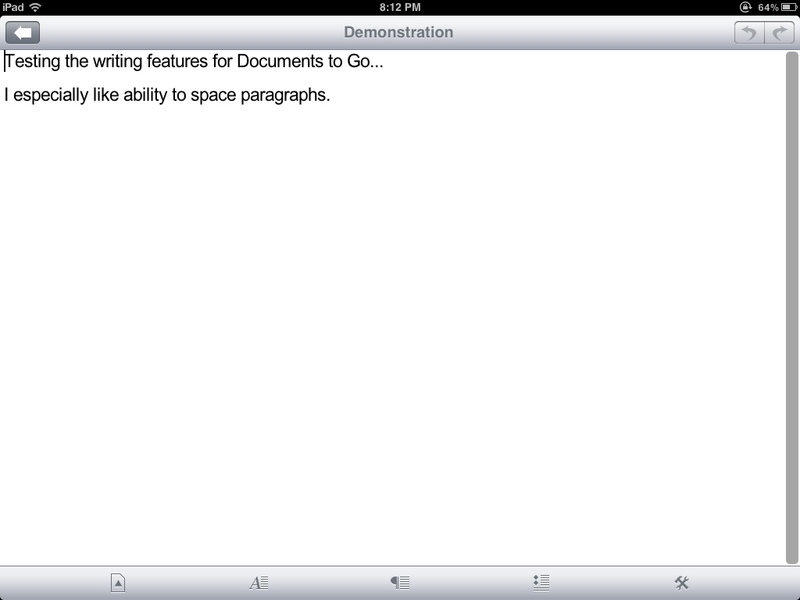 Documents to Go manages to split the difference and uses a simple button layout and has no page view option at all. While Documents to Go has some quirks, mostly due to it's universal nature, it's still the best editor layout among the three suites. 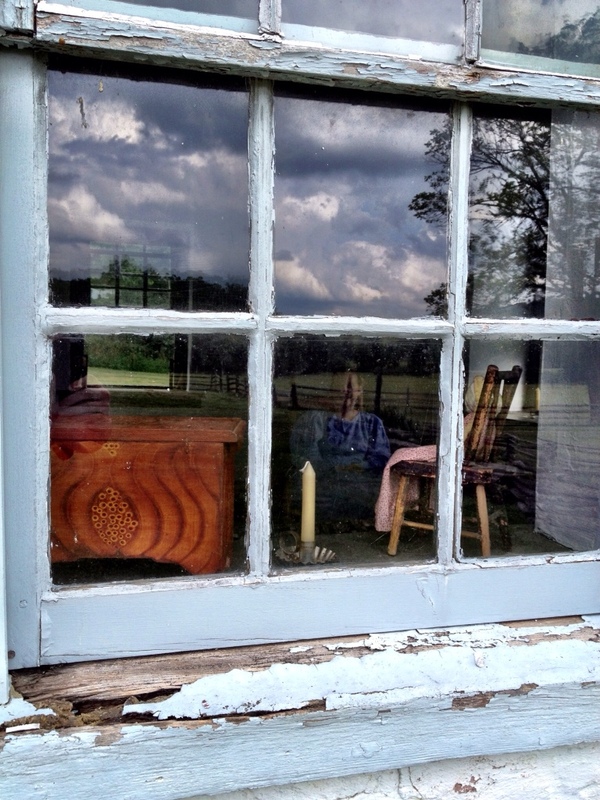 Note: This post was first published at Painfully Hopeful. Each suite will be explored for file management, editor layout, editing features, and importing/exporting. We'll primarily look at the word-processing features of each suite, but will also compare the spreadsheet and presentations modules for each app. Today we'll be looking at the first comparison – file management. Each app has, on the surface, a similar way of handling files. A list of files is presented, with various ways to access files which have been imported by different methods. The differences in methodology, however, highlight some of the biggest differences between the suites. 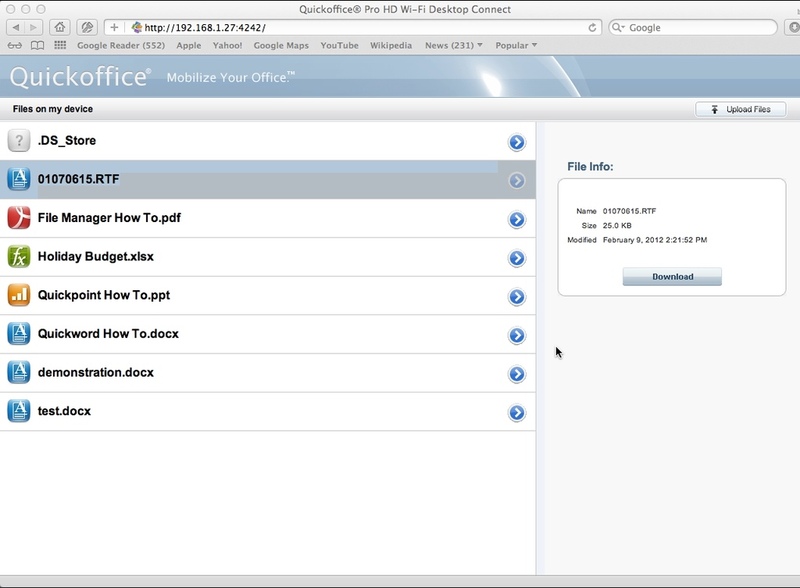 Quick Office makes use of a slick three-pane interface with services in the left-pane, a file list in the center, and file information in the right. Users can also drag and drop files in to different folder, between services, or down to the special icons at the bottom of the screen (for trash, email, and export). Data is presented cleanly, with inviting icons and good visual feedback. Using the left-pane to list connected services is also a good choice. Files can also be searched for in the ever-present search box - a nice touch. There are some aspects to the way Quick Office handles files which hinder my work-flow. First, folders aren't listed at the top of the file list by default. This means scrolling through a list in order to find a particular folder (the search box doesn't seem to return results for folders). Additionally, support for some key Google Docs features is limited. Google Docs allows users to star documents which may not have any other connection other than being "important." In Quick Office there is no way to see which documents have this flag (or add it to an existing document). As a Google Docs user I rely on this feature heavily, and would love to see it included into Quick Office. Like the other suites in this category, Office 2 HD gives the user a list of files which can be viewed by a user – but it's implementation isn't as slick as Quick Office. First, this suite uses only the left third of the screen to list files, wasting a good amount of real-estate when browsing for a particular file. Second, it always defaults to files created on the device or brought in via a local computer. To access other services, the user has to tap the "back" button upon opening the app – this feels unintuitive. While Office 2 lists folders prior to individual slides, it lacks a any kind of search feature to locate files. This omission is all right for small collections of files, but for people who write constantly, it's lack may be a deal breaker. Moving and exporting files is also not as easy as it is in Quick Office, and the email function is hidden behind the blue arrow next to each file name. Miss the triangle, and the file ends up opening instead. All in all, the file management features of Office 2 HD leaves much to be desired. This suite uses a single pane approach to file management. This makes the interface adaptable for the holding the iPad in either portrait or landscape orientation – it's also frees the app to have the same file management UI on the iPad as it has on the iPhone. Given that Documents to Go is a universal app, this makes sense of a design standpoint, it fails to put the larger screen real-estate of the iPad to good use. Still, there are some nice features in the file UI for Documents to Go. Documents which have been locally downloaded have blue icons, and a file size next to the document name. Remotely stored documents are greyed-out, giving a quick visual clue for which documents are locally accessible. Folders are handled separately from individual files, creating a easy way to browse them. Also, even though it's hidden behind blue arrow, a user can star items which are being accessed through a Google Docs account. There is also a special selection in the menu for "starred items," a nice touch. Search is handled by a soft-button at the bottom of the screen, which returns results for the currently accessed account. Other soft-buttons at the bottom of the screen include – local (for documents created locally on a device), online (for online accounts), recents, store (to upgraded to the "premium version" - this is a waste of space), and settings. The interface isn't as clean as Quick office, nor as cluttered as Office 2 HD, but screams "basic." The special Google Docs features, easy folder access, and visual cues for which files have been locally cached are wonderful strokes of genius in Documents to Go. The sheer slickness, easy of navigation, and persistent search box make Quick Office the clear winner for file management in this field. If you are in the market for a new computer, it might be time to consider a tablet computer like an iPad. These versatile devices are becoming more and more capable as general purpose computes. The touch screen interface allows a vast number of ways to input and manipulate data, and the size simply cannot be beat. If you are in the market for a tablet, however, what do you need to make it a truly useful device? Below are some ideas to outfit your new-era computer. An external keyboard — after a while most people to grow accustomed to typing using the on-screen keyboard, but for long sessions (say, typing a sermon) a keyboard is a great compliment to an iPad. Don't both with the integrated keyboard cases, the keyboards are often cramped and difficult to use. Instead, you can go out and get the Apple Bluetooth keyboard ($69.99) or a generic keyboard ($22.00) from a reseller like Amazon. As always, read the customer reviews before making a purchase. A stylus — Steve Jobs hated the concept of a stylus, and for every day navigation of a touch screen he was absolutely correct. For note taking, however, a stylus is indespensible. Instead of running out to a local store, however, do some quick searching on the web — a decent stylus can be purchased for under $10. Again, make sure you read the user reviews before placing an order. A screen protector — There is a much debate as to whether or not an iPad even needs a screen protector (the glass is specially tempered to resist scratching). If you're going to be carrying the tablet around with you, however, the addage "Better safe than sorry" may be your friend. Many Apple stores found in a mall setting have an independent kiosk outside which will install a front and rear shield for an iPad. The process can run around $40, but you're paying for piece of mind. If you're more adventurous, the Invishield is a quality protector. An iPad bag — A tablet like the iPad is extremely portable, but it's nice to have a bag to carry both it and it's accessories around in. This is one purchase I don't recommend making on line. Instead run out to Target or Staples and see what bags they have for tablets. Make sure it will have room for everything you want to carry around with you. Video adapter — The Apple VGA ($29.99) and HDMI ($39.99) adapters are both great for allowing an iPad to display content on a large screen. The VGA adapter is more common on projectors, so I'd recommend starting with that. Keynote ($9.99) — If you need to make presentations on an iPad, there is no better solution. This should be on the iPad of every public speaker. Documents to Go Premium ($16.99) — This is a flexible office suite which can handle word processing, spreadsheets, and simple presentations. The premium vesion also connects to cloud storage systems like Google Docs, Box.net, and Dropbox. As a bonus, this app can also be installed on an iPhone or iPod touch. Notes Plus ($6.99) — A simply beaufiful note-taking app with a flexible interface and stellar-looking ink. If you like to write notes, this is the tool. Welcome to the new ABCNJ.net! As we get our momentum moving through 2012, we wanted to provide the region with a site as lively and dynamic as ABCNJ itself. To that end, we have created this elegant (and simplified) site for the ABCNJ family. Keep coming back to ABCNJ.net throughout the year for insightful articles, videos, event updates, and muchmore. Come, and be part of our ministry conversation in 2012 and beyond!